“harrying of the North”, in 1080 AD. The vital connection between Hunmanby and Filey is that Filey, originally attached to the southernmost corner of the Falsgrave Manor was gifted over to the Hunmanby Manor by William the Conqueror at this period. Due to the foregoing, the Lord of the Hunmanby Manor (Gilbert de Gant and his successors) possessed by title all the lands from Filey in the north to Reighton in the south, inclusive. This included all of Filey, Hunmanby and Reighton sands and ‘’ a javelins throw at low water’ into the bay. To establish this right for the Lord of the Hunmanby Manor, a chosen horseman rode out into the water and threw a ceremonial javelin out to sea. Everything on the landward of the javelin was the property of the Hunmanby Lord, with the exception of the ’Royal’ sturgeon - a rare fish which had to be handed over to the King. This was ceremoniously acted every year until the Hunmanby Manor was ‘sold off’ in 1920-21 by Sir Denis Readhead Bayley who had bought the manor and its Lordship from the Mitford family a few years earlier. Although selling the estate, Sir Denis Readhead Bayley retained the Lorship and re-enacted the throwing of the javelin ceremony for the last time in 1928, shortly before his untimely death. Thus Filey was successfully husbanded by the continuing Lords of the Hunmanby Manor throughout the centuries. Land and property belonged to the Lord of the Manor and practically all inhabitants were tenants. During the Eighteenth century a few lands etc. were bought by private individuals which complicated the manorial system The usual practice to re-organise things was to invoke an Act of Parliament referred briefly as the Enclosure Award. This involved nominating roads, fields, common land etc. so that all could be properly surveyed and apportioned to their rightful owners. Three independent Commissioners were officially appointed to ensure fair play. Humphrey Osbaldeston, then Lord of the Hunmanby Manor decided to ‘enclose’ Filey – independent of the general Hunmanby Manor – in 1791. After this successful enclosure he then enclosed the remainder of the Hunmanby Manor in 1809. Both enclosures were surveyed and mapped by Joseph Dickenson, a noted surveyor. This ‘double’ enclosure brought most of the Hunmanby Manor – which included most of Filey - definitively further under Humphrey Osbaldeston’s because he was by far the largest ‘land-owner’. The fact that the Hunmanby enclosure was the southern boundary of the Filey enclosure, further strengthened the hold of the Lord of the Hunmanby Manor upon Filey. The 1830’s were a notable time for the small hamlet of Filey which effectively consisted of approximately one hundred properties situated around what is today Queen Street and Mitford Street. A prominent West Riding gentleman, John Wilkes Unett had plans drawn up for ‘New Filey’; a proposed seaside resort, which extended southwards from Queen Street, eventually incorporating (today 2005) Murray Street and West Avenue, and the complete sea frontage west of the Ravine. Naturally the land had to be bought from the Lord of the Hunmanby Manor which by 1837 was Admiral Mitford at Hunmanby Hall. The sale of these lands was not completed in one simple sale. At least five separate sales of land took place as ‘New Filey’ expanded rapidly with the coming of the railway in the 1840’s. The Mitford family had inherited the Hunmanby Manor from the Osbaldeston by virtue of such estates always passing down through the nearest male successor. The Mitfords were huge landowners whose base was at Mitford Castle, County Durham and they had vast experience of selling land. It was their habit when selling large sections of land to always keep a few prime sites which could later be sold separately at much higher figures. 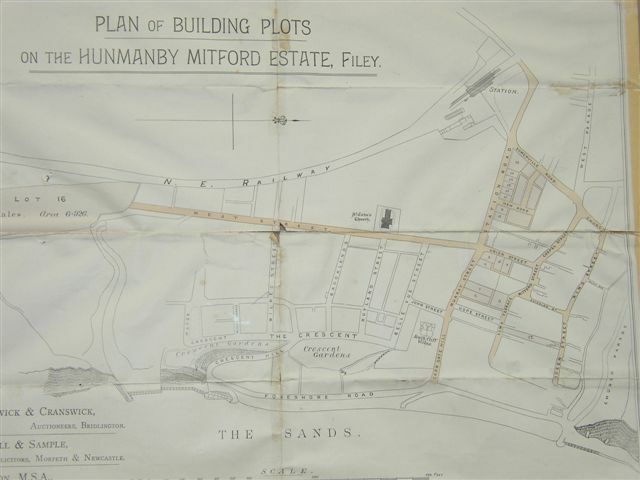 The map above shows the final sale of land from the Hunmanby Manor to the ‘New Filey’ developers. It is undated but some idea of the date can be judged from the names of some of the streets which were changed at a later date to their present identification. Note that the sites in Murray Street (2005) are today Banks, Supermarket and Post Office – prime sites indeed. Perhaps the reader of this small piece of local history will appreciate that whilst out-growing its ‘parent’ village of Hunmanby, it should never be forgotten that Filey truly was ‘born of Hunmanby’.